The Billboard Music Awards are an awards ceremony occurring every year since 1989 and held in Las Vegas, Nevada. Billboard magazine, which held the event, covers every music event and produces their music popularity chart. This year, Chrissy Teigen and Ludacris hosted the ceremony. Taylor Swift led the winners’ circle tonight winning eight awards after being nominated for fourteen. Like many music events the attire is less conservative and freer to creative interpretation. Despite a few overdressed or poorly dressed attendees there were many fashion successes, here, Ink takes a look at the best red carpet looks of the evening. Jourdan Dunn, Olivier Rousteing, and Kendall Jenner donned studded and edgy looks. The overall effect felt much like an ad for Balmain, which I am sure was the point. Zendaya effortlessly paired animal print with beads and embellishments. On most people the look would appear overwhelming but she pulled it off with such confidence that she looked like a rockstar. Nick Jonas took a risk by actually wearing a color to a red carpet event. This is a challenge in itself and something that many men shy away from. However, by pairing a purple button-down shirt with a purple suit the ensemble appeared sleek and modern. The suit had a slight sheen that made it appropriate for the event and did not blend in with his matching button-down. This summer jumpsuits are commanding attention and so is Taylor Swift who wore a white jumpsuit with cut-outs. The jumpsuit was edgy and sleek, which made it the ideal outfit for the occasion. Calvin Harris who, unlike Nick Jonas, took a safer approach with a navy suit and black button- down. Idina Menzel takes position as classist look for women with her classic Hollywood hairstyle and short, off-the-shoulder dress which made her appear less conservative. 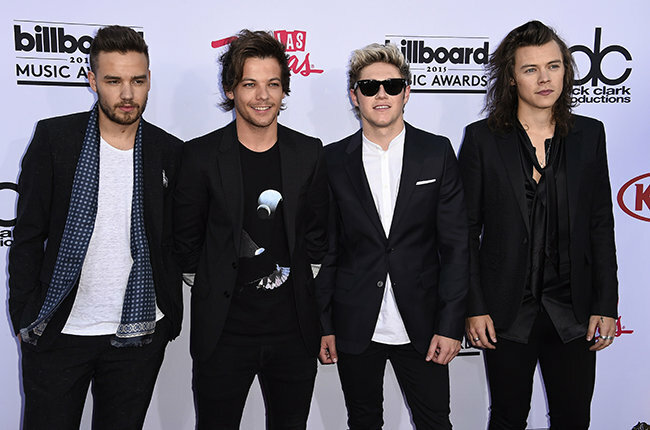 The award goes to One Direction, sporting a look with four people and not five. The muffled cries of One Direction fans could be heard for miles. At many music events, artists ultimately aim to win an award for their craft; however, they are also judged on their style and all eyes are on them to witness the moment they fail.